Few Newfoundlanders realize that in the months leading up to the famous disaster, the Hindenburg actually made a number of trips over the island. The Hindenburg — the most famous German airship of them all, has an interesting connection to Newfoundland. The zeppelin, which crashed on May 6, 1937 and claimed the lives of 36 people, actually flew over the island just one day before the infamous disaster in the northeastern United States. 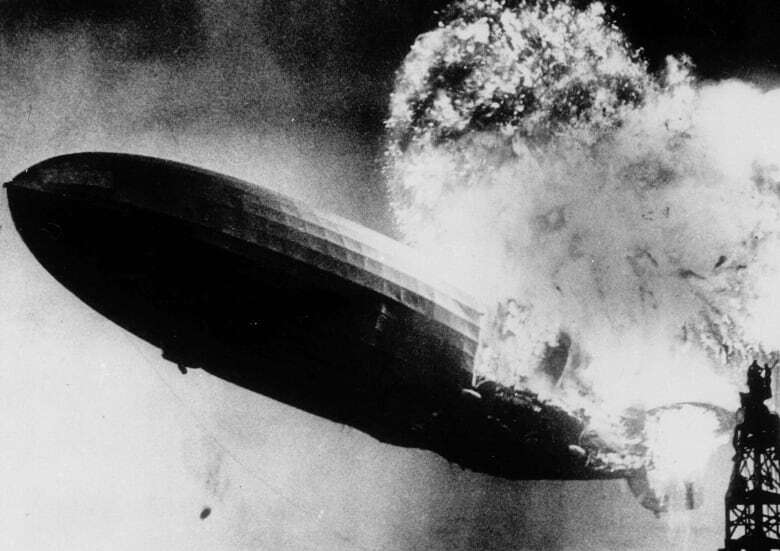 The dramatic footage that played around the world — showing the German dirigible as it went down in flames in Lakehurst, New Jersey, is one of the classic pieces of newsreel footage from the era. Today, a quick Google search of 'Hindenburg' brings mostly references to the disaster — which heralded an end to the public's faith in airships as a practical way to transport people around the globe. Interestingly, in the months leading up to the disaster, the vessel made a number of trips over Newfoundland — which was then under the control of the Commission of Government, and still 12 years from confederation with Canada. Just one day before it went down in flames, a passenger on the Hindenburg — famous German contortionist Joseph Späh, was filming from up in the zeppelin, capturing images of icebergs off the coast of southeastern Newfoundland. A survivor of the disaster, journalist Leonhard Adelt, described what the passengers saw. "On the third day we sighted Newfoundland," he said. "The giant iceberg turned into a monument of sparkling brilliance. We glimpsed the foothills, the lighthouse on Cape Race, the limitless forests of the hinterland." "Then the coast sprang back and we floated, a grey object in a grey mist over the invisible sea." 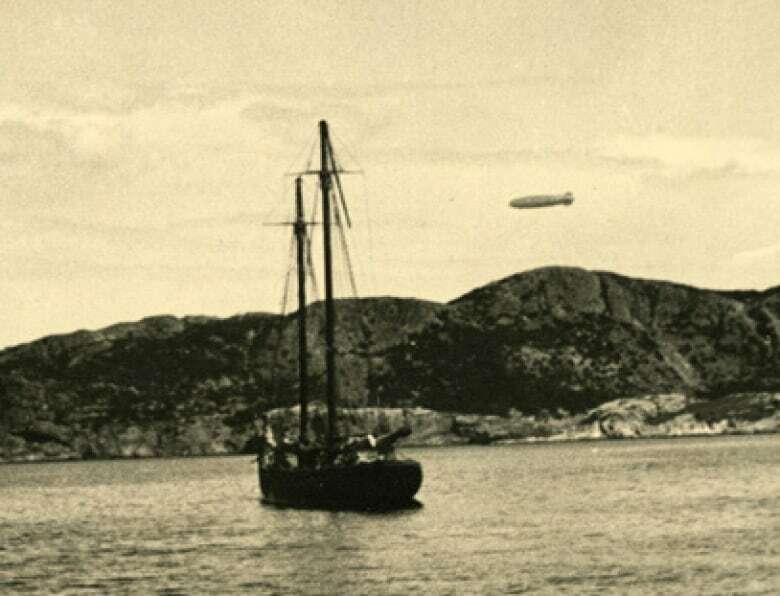 While those on the Hindenburg were treated to the beauty of Newfoundland from above, the people living around the island who saw the zeppelin must have been completely amazed at what they saw floating above them. In a time when there were no highways and most people had never been on an airplane, seeing the large futuristic-looking vessel overhead must have been an incredible sight. One of the Newfoundlanders who saw the famous airship on its last flight was 80-year-old Ruth Simms, from Little Bay Islands — now living in Florida. She will never forget seeing the Hindenburg, casting a shadow over her small, isolated outport community on May 5, 1937 -- one day before the infamous disaster. "I saw the zeppelin fly over Little Bay Islands. It looked like it was going to hit Mack's Island," she said. "It glided over. We could see the ropes hanging." Simms was shocked when, just one day later, she heard the Hindenburg had crashed. "The next day we heard it went down in Lakehurst, New Jersey," she said. "We were in the garden with grandmother Simms. She grabbed Gerald and me, ran to the house and said 'Nel, it's the end of the world,' poor thing." Gerry Strong, while looking through his mother's photo albums, found a remarkable picture of the Hindenburg in St. John's — near what is now Bannerman Park. 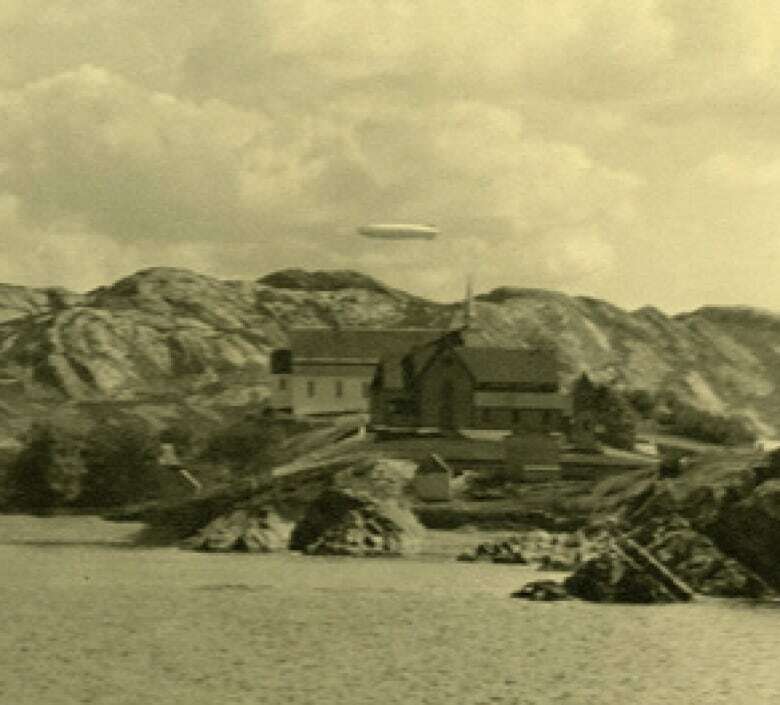 It was taken by his mother Marjorie, and shows the giant airship hovering over the Colonial Building, then the centre of political power in Newfoundland. The LZ 129 Hindenburg made 17 round trips across the Atlantic throughout 1936 and 1937 — bringing passengers from Europe overseas to the United States and Brazil. It was during those trips to the US that it flew over Newfoundland, likely leaving those on the ground, many of whom lived in small isolated communities, awestruck at the sight. Lisa Daly has been researching aviation history in Newfoundland and Labrador for a number of years under her adviser, Dr. Michael Deal. 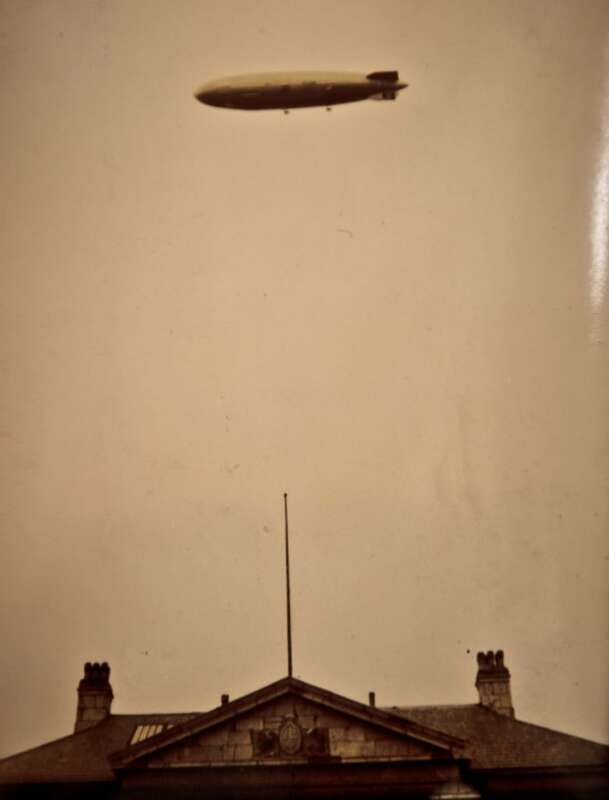 Dr. Deal has written about the history of various dirigibles over Newfoundland, but Daly was particularly interested in the most famous of them all — the Hindenburg. "While he looked at a bunch of different dirigibles flying over Newfoundland, the Hindenburg was one that captures everyone's imagination, particularly my own," she said. It was from there that she began travelling around the province, trying to collect whatever pictures and stories she could of the airship over the island. "I wanted to see just how many sightings there were over Newfoundland — I never realized it," she said. Daly said she traced a number of the crossings, mostly from first-hand accounts of people who will never forget the day a large, German zeppelin hovered over their community. "It was such a big deal to people," she said. "Even at four years old, someone even now still remembers seeing the Hindenburg in the sky." The 13 crossings over Newfoundland happened during the spring and summer of 1936 and 1937, when the vessel would take advantage of good weather conditions in the North Atlantic en route to its mooring station in Lakehurst, New Jersey. "It was seen all over Newfoundland," Daly said. "It was seen on the Northern Peninsula, out in Corner Brook, Deer Lake, down on the Southern Shore, down around Burin and over St. John's on a number of occasions." The Hindenburg could do the crossing a couple of days faster than an ocean liner, and was reported to be much calmer for those with a tendency for sea-sickness. And of course, there was the view. It's been almost 80 years since the Hindenburg was seen over Newfoundland, and not many people are left who would remember seeing it. Perhaps it isn't even that historically significant, but recognizing that it actually flew over Newfoundland is a great reminder that the island has always been relevant in world aviation history. Whether it was the transatlantic crossings of Alcock and Brown, Amelia Earhart, or hundreds of international flights being grounded in Gander on September 11, 2001, geography has always placed Newfoundland front and centre in the world history of air travel. Those examples have been recognized with books, documentaries and monuments, but the Hindenburg's last flight seems to have slipped through the cracks of history — to the point where it is almost forgotten today. However, for those Newfoundlanders who looked up in 1936 and 1937 and saw the giant airship, with Nazi swastikas proudly displayed — it would have been clear that a piece of history was literally passing right over their heads. 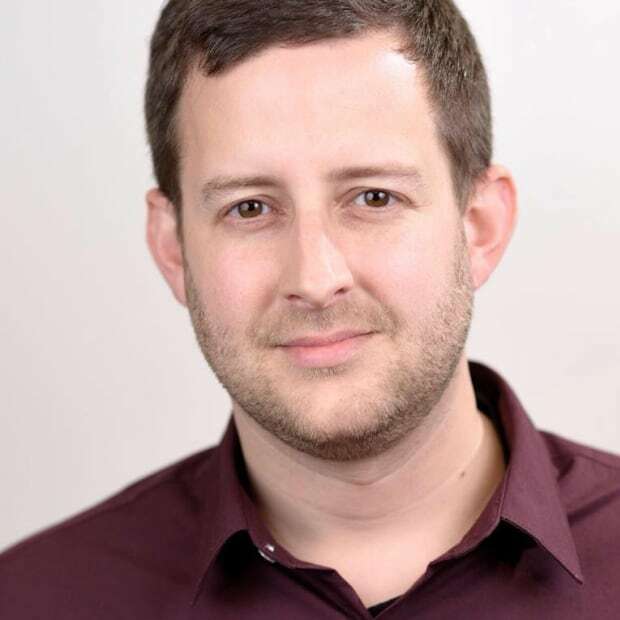 Geoff Bartlett is an educator and journalist in Corner Brook.